I woke up this morning and decided to cut all processed food from my diet including sugar and dairy. Gillian McKeith, eat your heart out! I started with my favourite breakfast: two bowls of rice, umeboshi (pickled plum), natto (fermented soya beans) and nori and a pot of Gyokuro tea (high-grade Japanese green tea) et voilà, I’m well on my way to detoxing. As the afternoon progressed, I consumed a lot of herbal tea and water with lemon. 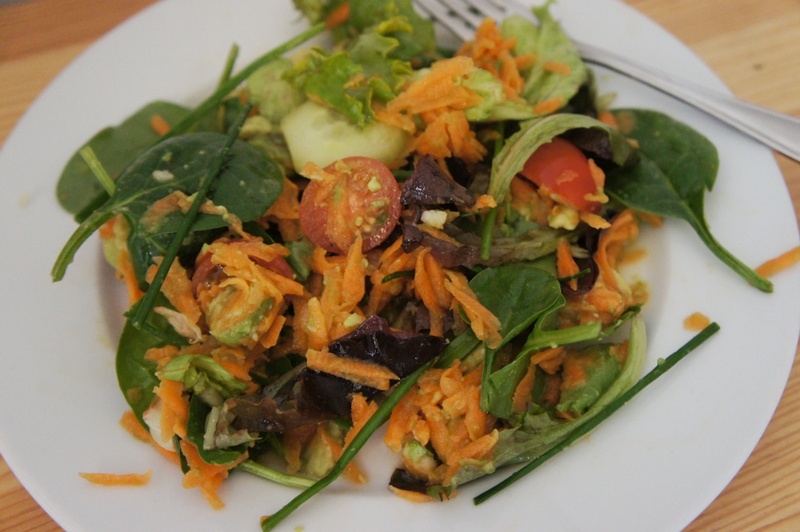 I had a large salad for lunch: cherry tomatoes, grated carrot, baby spinach, avocado and cucumber with an extra olive oil, one crushed garlic and apple cider vinegar dressing. If there was only one thing I could eat, it would be salad. So fresh, healthy and tasty. Come early evening, my head was killing me and Jelly Tots, sticky toffee pudding and well, pretty much anything with sugar filled my mind. 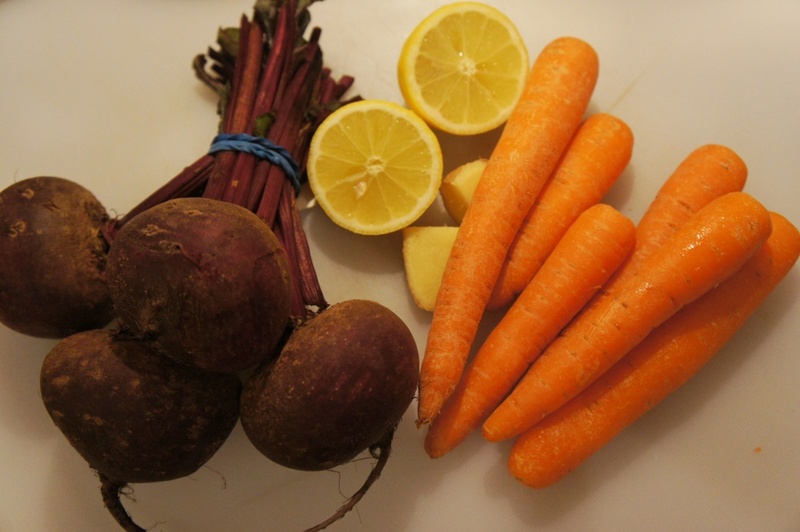 Instead, I juiced beetroot, carrot, lemon and ginger, which is ridiculously sweet and kills those sugar cravings instantly. 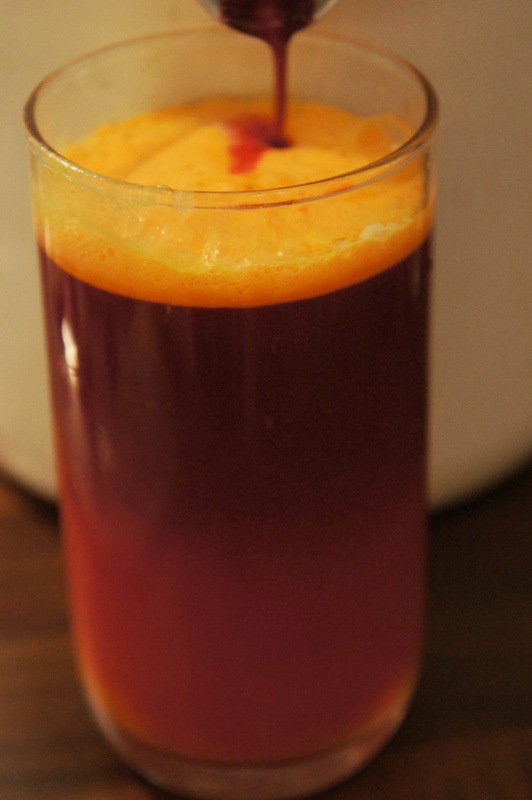 Have you ever juiced fresh beetroot? Not only is it nutritionally dense, it is so full of flavour. The perfect dinner/dessert to end detox day #1. I still have a killer headache so a hot shower and bed for this wee detoxer. Have you ever detoxed? What did you experience? Best and worse parts? So tasty and really quick to make. Give it a try! Oh no, dairy intolerant…my worst nightmare! How I love cheese and would hate to give it up though I’d be certain to lose a few pounds! Good luck with your detox. Clearly we share nightmares Lissy! I had a test a few years ago but have ignored the results. I told myself that if the results come back the same, I will change my eating habits. I don’t really mind about cheese but butter and cream in my desserts are musts! Yes i’ve done a 10 day fresh fruit/vegetable juice detox and loved it! i now make fresh juices atleast 2-3 times a day! The first few days are usually rough but if you can push through..you will feel great! Good luck! 10 days? Amazing!! Day two is going well so far and I have some different juices to try. Thanks for the good luck, I’m going to need it! So glad you love your print and that it made it to you this time .. all it needed was for me to put the correct address on! 😉 Happy January, darling. I’m so not the healthiest person! I just want to get back to my normal routine and feel better about myself. Detoxes are great because they’re not too extreme, at least not the type I do. It is just about giving my body a break from the bad stuff. Love, love, love the print! Cannot wait to put it up! Ah yes welcome to the official dairy intolerance club! Only problem is I’m also intolerant to soy so that takes out soy milk too! I’m devastated I can no longer just grab a cold, tall glass of milk….I used to drink litres of milk a week on my own! 🙁 Almond milk is too sweet to drink as normal milk but works well with chocolate (which unfortunately I also shouldn’t have). You are astounding with your discipline! I am not looking forward to returning from ridiculous indulgence in France and having to do a much stricter diet. I am ridiculously jealous you lost 3kg in one week from just no dairy!!! I lost 2kg in 1.5weeks when I first started my diet but then plateaued…and lost motivation. I don’t actually need to lose alot realistically but I’ll be looking to you for tips! p.s. Beetroot….yeeuck!! You should come here-they love beetroot in heaps of things! We need badges and matching coats! 🙂 Soy milk is utterly vile. What I do to mask the flavour is gently simmer it with cinnamon and nutmeg (and sometimes I piece of 70% chocolate). Almond milk is okay. Rice milk is too thin. I just bought some oat milk so will try that, have you tried? I’m like you, I thoroughly enjoy a glass of cold milk but it makes me sick. About 8 years ago, I had a problem with my gallbladder and changed my diet overnight. Moving to France changed everything as it was the first time I ate dairy in years. I was eating dessert every day and going out a lot because I was leaving. Now I’m back to my normal healthy eating so the weight is falling off. France is the land of indulgence so enjoy! Once you get back to your normal weight. A little holiday weight never hurt anyone. I am SO for matching badges and coats haha. I have no issues with choc soy milk but it does taste “different”. I agree-rice milk was watery and tasted too much like rice! I like rice but not in liquid form. Let me know about the oat milk because I was thinking about trying that next time I’m at the shops. Mum has her gallbladder removed in October because she started having vicious attacks so you guys can commiserate. She really struggled with serious pain (and she ain’t no wimp) until they did the surgery. I wish my tummy would fall off haha. Because I’m a pretty healthy weight, I don’t lose anything easily-maybe more exercise just to tone up. Problem is I’m lazy as! “I wish my tummy would fall off” – oh my goodness, that made me laugh so much! Too funny! I’ve never detoxed. I am a firm believer in a complete change of eating lifestyle. Fruit and vegetables are the most important part of my meals, I rarely eat confectionery desserts, only home-made cakes, using raw sugar and natural ingredients (I have a few recipes that don’t require sugar at all, one of which is an apple pie and I use raisins for a sweet flavour). I have never believed in diets. They are useless unless you make it a habit out of eating healthily. I agree that diets are useless. I’m baffled by people who exclude entire food groups for weeks on end. Detoxing is different – it is about giving your body a break from the negative things we consume and introducing more natural products. I appreciate your view but I think it is a little intolerant of people who do not have the time, finances, will power or understanding to completely change their diet. People have to try, non? I don’t agree that detoxing is useless – any opportunity to fill one’s body with healthy, fresh foods and improve our lifestyle is never useless. You really are good with these detoxes, i must say! I have never done it before and i know i’ll fail badly if i do attempt to do so,lol. Thanks Cinz! Just trying to sort out my skin and this is the best way possible. I ate sushi today and my skin is itching – I think there may have been mayo in it 🙁 Give it a go and stay optimistic, if I can do it, you can too! Let me know what you think of the beetroot juice. Well done Milla! Those detox symptoms are killer aren’t they? Have you tried almond milk? It’s pretty good. I don’t have dairy and honestly I never like it (aside from ice cream) but I had a very good response when I quit it altogether. Honestly, NO ONE should be “on” dairy – it’s not good for you so see it as a blessing! Wicked liver cleanse food choices there, beets and lemon. One thing, you gotta have a protein with every meal (protein, complex carb and fat, every meal). For your hair, your skin, you nails…if you don’t, you’ll end up with serious deficiencies and be tanking in your energy. Milla what I’ve been doing lately for vegetarian meals is adding quinoa into the salad or soup so it’s a complete meal (I know you’re not a big meat eater). Stay strong girl! Luv ya! Thank you Cupcake! Loving your tips! Those detox symptoms almost killed me. I cried and my head just pounded. I even put my sunglasses on in the house! Haha, what a drama queen! I agree with you, dairy is not the way to go. Thanks for the quinoa tip; one of my favourite things so I’ll include it in my diet. I’ve been eating sashimi a lot as well. Is it today that you had the doctor’s appointment? How did it go? Gillian Mckeith’s book where it is strongly recommended! I will take your advice on the beetroot juice.But do take mine-drink nettle tea. Popi! Yay, you know Gillian McKeith? Isn’t she amazing? I had some major problems with my gallbladder a few years and the specialist suggested surgery. Since I don’t believe in medical assistance unless I’m dying, I started reading Gillian’s books and within 3 days, the pains stopped and I never had the operation. I have two copies of her “You are what you eat” – one at home and one in my suitcase in case I have any issues when travelling. I am addicted to her advice – she introduced me to juicing beetroot 🙂 I love nettle tea, even the taste and sipping some as I type. Let me know how you find the book and detox. hi milla, thanks for stopping by! yes, i actually do like natto, it’s definitely an acquired taste though… i love your ume + white rice photo!! Yay, I’m happy to find a fellow natto eater! Most people hate it. 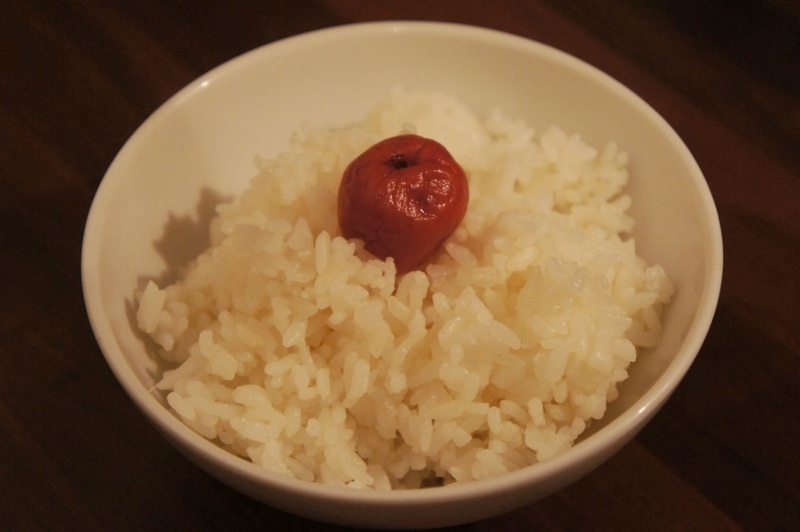 Rice with ume is such a good combo. can’t tell you how many times i already thought about detoxing. but the time never seems right. a friend of mine does it once every year (after two days of slowing down on food she’s living off cranberry-infused water for 7 days – don’t know if this is healthy) and she looks absolutely fabulous every time she did it. but i don’t know: shall i try it when i’m off or rather when i’m working? so i keep arguing with myself – and never do anything. Hold that natto! It looks vile but tastes so good. Better to do it when you have an easy schedule – you may experience headaches, be moody and just not in the mood to interact with anybody. Worth it though! Let me know how it goes. That’s great Dawn! The first few days are always tough but afterwards you really feel the benefits. 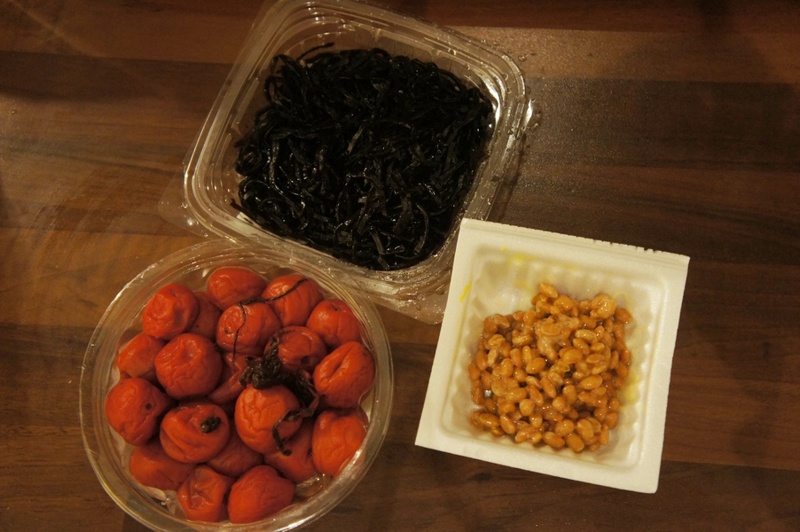 How good that you were introduced to umeboshi so early in your life, I only just discovered it a few years ago and am now addicted! Hope your detox is going well! After a few months in Paris, I’ve also felt the need to do a proper detox and after the 10 days we spent in Japan, it was the best motivation with all the wonderful foods they have to point me in the right direction! I hope the rest of your detox went (is going) well and I’m looking forward to exploring how I can do this in France!! Did you eat well in Japan? I found that I would be full without feeling heavy. The food is so ridiculously healthy there. Go to Pyramides and shop at the Japanese supermarkets. Let me know how it goes.